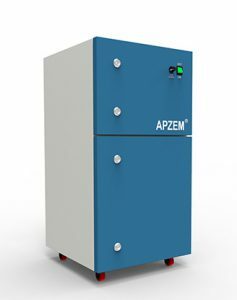 Apzem® Compact Professional series Laser Fume Extractors are specially designed extractors catering the need for compact, portable medium duty fume extractors with larger deep pleat pre filters, mini pleat HEPA filters and deep bed carbon filters for Laser marking , Engraving and medium duty cutting applications that generates more ultra fine particles and gaseous molecules. Our compact professional series fume extractors with bottom up air flow design decreases dust loading on filters as heavier dusts get settles down by gravity and only finer dusts gets accumulated over filter bags. This special design enables longer filter life and would works well in applications generating more dusts without filters getting choked. Also deep bed prefilters in Pro-series is completely enclosed inside a container and hence change of filters, carrying an disposing it can be made without having any contact with hazardous dusts particles. All our Compact professional Laser fume extractors comes with options to have three stages of filtration deep bed pre-filters, HEPA filters, Carbon or chemical filters and an option to control air flow, easy interfacing with industrial Laser Machines to control start & stop of fume extractors, VOC and Gas sensors to monitor outlet filtered air, filter choking alarm indication for filter change etc.. All these special features gives user greater control on dust & fume extraction and increases productivity and safety.